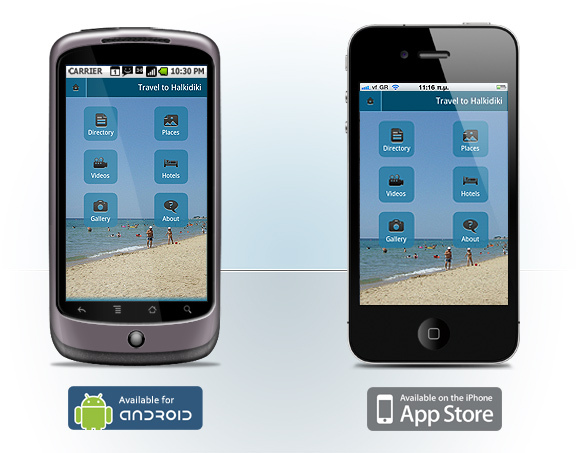 HALKIDIKI Travel To Halkidiki – Free Application for iPhone & Android ! Travel To Halkidiki – Free Application for iPhone & Android ! One of the best online guides, Travel To Halkidiki, now in the palm of your hands with its free application for iPhone and Android. Download the free application and discover more than 700 suggestion for hotels, bars, restaurants, points of interest, beaches and activities like diving. A very light application despite its rich material in information about the island, videos and photo galleries. Travel To Halkidiki will become your favorite guide during your stay on the island.